Today, Laura and I went out for our first works Christmas lunch. As we’re both now self-employed and working at home, neither of us had other colleagues to do this with, so a festive lunch together seemed like a nice tradition to start. Having my short story ‘Surprise Me’ published in Daily Science Fiction. Deciding to take my destiny into my own hands by self-publishing. Releasing my first self-published books, learning a lot and getting some great reviews. Getting enough freelance writing work in areas I love, mostly history and science fiction, so that I could stop bidding on less interesting projects. Writing three whole novels in the space of a few months, and working with an editor on two of them. Because they’re ghost writing I can’t say more about them, but it’s been great fun. Joining the writing team I’m now part of for the ghost writing gig – they’re a great bunch. Getting to know fellow readers and writers through the internet, especially those of you who regularly frequent this blog. I didn’t make great use of social media before the last year or so, and it’s been fun getting to know interesting people I didn’t before, as well as chatting with a few who I did. 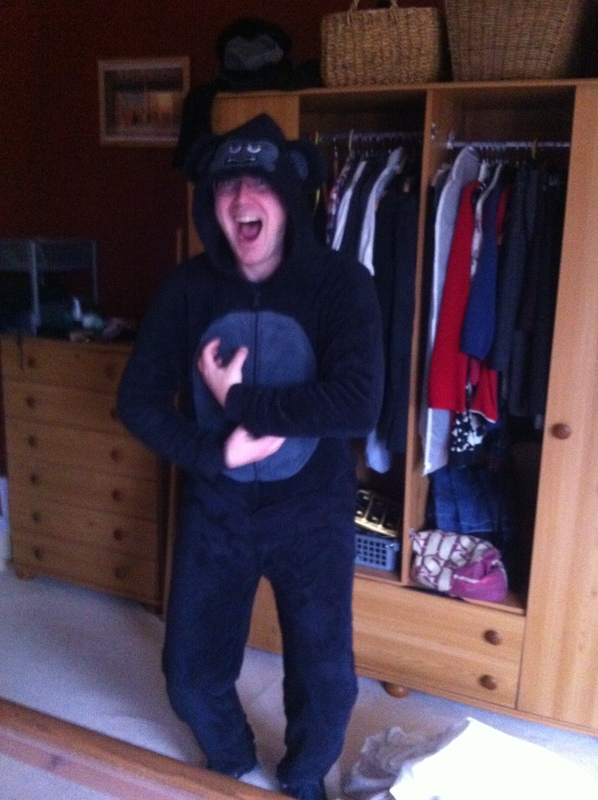 Getting my gorilla onesie. It’s only a writing thing because I sometimes wear it to keep warm while I work, but damn I’m grateful for it now that winter’s closing in. That’s right, I am exactly as cool as a three-year-old playing dress up. Next year I’m hoping to build on all of this. I have plans to finally publish a series of steampunk novellas in the spring, and then get back to my more heavy duty fantasy Rome novels. The sci-fi ghost writing looks set to continue. And I will of course keeping filling this space with words. How about the rest of you – what have your highlights of this year been, whether related to reading and writing, science fiction and fantasy, or any other thing? Share some of them below, and lets celebrate together. I mentioned yesterday that, for now at least, my latest book is only available on Kindle. I know I have some readers who use other devices, and that this has to be annoying for them, so I thought I should explain why, as well as talking about my views on how Amazon approach this. For those who don’t know, Amazon’s Kindle Direct Publishing includes an option called KDP Select. If an author enrolls one of their books in KDP Select then they gain certain advantages – primarily that they can give it away for free via Amazon for a few days, which most authors can’t otherwise do, and it is included in the Kindle Unlimited reading package, increasing the likelihood of people reading it and giving the author a taste of that sweet, sweet Unlimited money. The catch is, each time you enroll the e-book in Select you do so for 90 days, and during that time you can’t publish it in other e-reader formats. Normally, this is something I don’t do. I have no objection to Amazon offering benefits to those who work solely with them, but I’d rather not be reliant on one platform and am uncomfortable with the potential monopoly it supports. That said, having something in Select is a potentially huge way for an author to find new readers and draw them to their work. On that basis, I’d been planning on putting something on Select at some point, though I hadn’t yet worked out what. Then this November hit and I took on more than I could do at once. 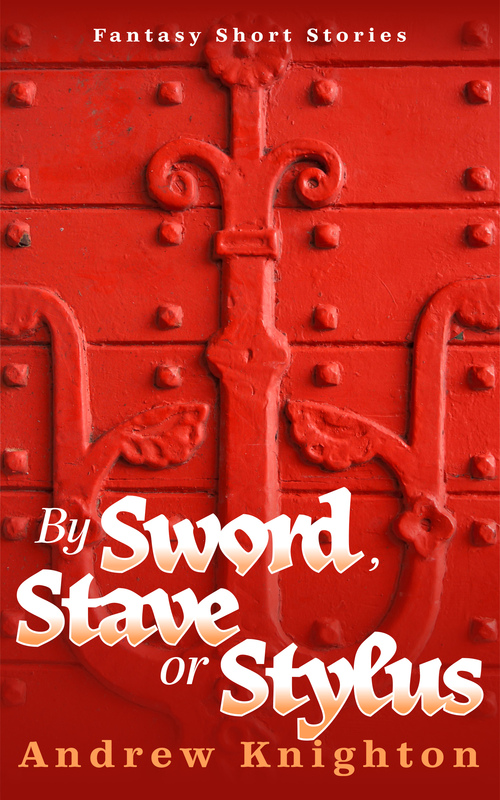 Formatting a book for Amazon is relatively easy using Scrivener, but formatting for Smashwords takes a lot more work. So rather than stretch myself further by preparing Lies We Will Tell Ourselves for Smashwords, I decided to make this my experiment in trying out Select. Of course the same workload also meant that I dropped the ball in getting the book up on Select, not sorting my free days out in time for the book to go live on Monday, and then finding on Tuesday that I couldn’t start the free days on the day I was in. But I’m there now. Lies We Will Tell Ourselves is free on Amazon from now until Sunday, please go grab a copy and enjoy. Sorry to my non-Kindle-using readers – I’ll make it up to you at some point, I promise! A spin doctor forced to deal with aliens who loath lies. How We Fall – trapped behind enemy lines, faith and duty clash for Sergeant Grund’s squad. So Cold It Burns – long cut off from home, Gandpa Jo must decide the future of his frozen wife. Distant Rain – the submarine Promethean hunts a mutant whale through a polluted Pacific. Our Man In Herrje – Julius Atticus lives by lies, but can he defend them to the alien Gatherers? Day Labour – a dark secret waits for the farm labourers of a distant world. Digits – a robot finds his humanity in a hand. The Extra Mile – race driver Geordie proves how far he’ll go to win. Second Skin – stock trader Eddy’s symbiont has all the latest apps, including one no-one told him about. The Harvest – as aliens devour the Earth, an anthropologist recognises an unsettling truth. 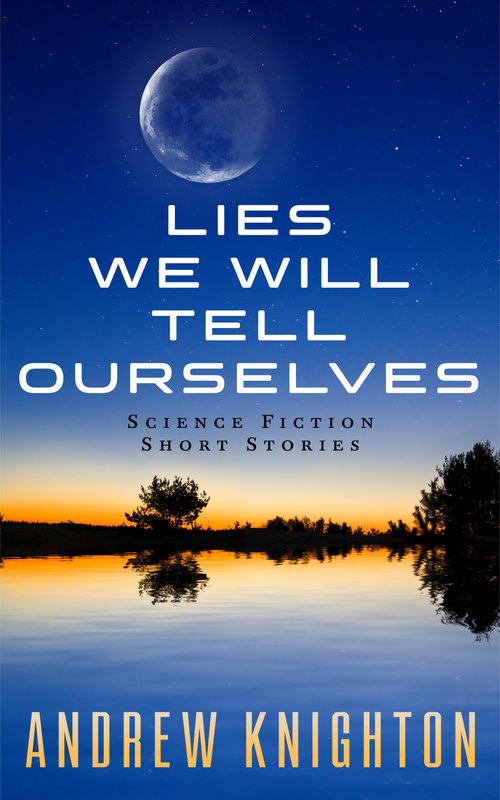 Lies We Will Tell Ourselves is out now on the Kindle. I’m just releasing it there for now as experiment, and I’ll get into my reasons another day. But because it’s exclusively on Amazon I’m able to give it away through there for a few days, and so it’s free from tomorrow until Sunday, after which it will still be only $1.99. So what are you waiting for? Go forth and read your way into a bright new future! As an experiment in book marketing I want to try to get some reviews of this book up on Amazon on the day of release. So if you think you’ll have time to read around 20,000 words by 17 November (maybe a quarter of a novel’s worth) and you’re willing to write an honest review in return for free stories then drop me a line or leave a comment and I’ll send you a free copy of the ebook. All I ask in return is that you do your best to read the book and leave a review and rating on Amazon on 17 November. 5306 words so far, so I’m on target. The detectives have their first lead, and I have to plan chapter two before I write any more. Ewa S-R – OK, Ewa had a proper surname but I didn’t get it, and the internet has not helped me solve that problem – she’s a blogger and an ex-bookseller and if anyone knows who she is please tell me because I want to go read her blog [edit: I found Ewa on Twitter thanks to Carl Barker – cheers Carl – this also means I’ll now be spelling her name right]. I’ve read and listened to a lot of opinions from authors on how to get noticed. Getting the perspective of other professionals with different views on what works was fascinating, if not always surprising. For Sophie, events at bookshops and libraries are key in promoting a book. Libraries are in the top six ways people discover authors, so it’s good to be present in them. 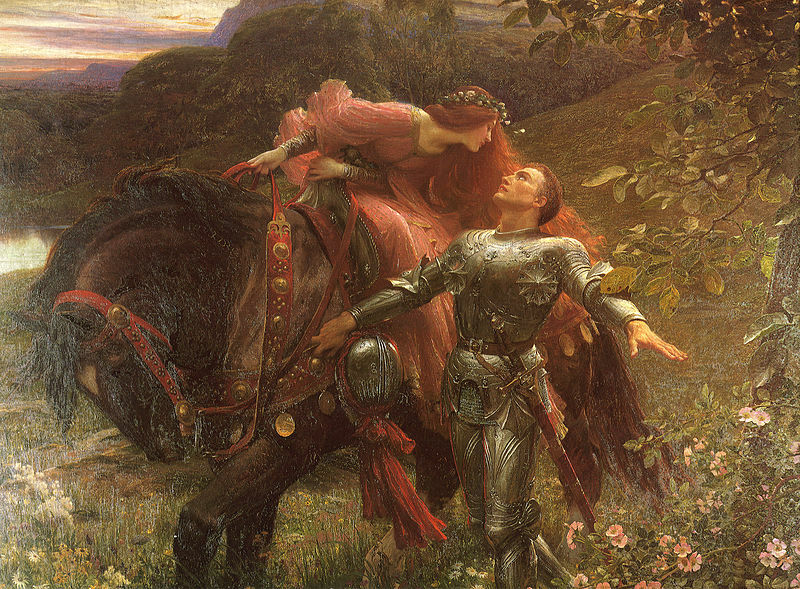 Graeme said that approaching libraries hadn’t worked for him. Allen pointed out that a lot of libraries are looking for a purpose to justify their existence as people come to them for books less, and if they have some autonomy then they can be a good way of getting some publicity going. For Graeme what’s been more useful is local bookshops, though he’s found it hard to get into big chain Waterstones. Sophie mentioned that 65-70% of booksales are still through physical bookshops, making booksellers and word of mouth very important. Nazia and Ewa both enthused about how much they’ve enjoyed selling the books of authors they like. Pushing a book in a shop is an extension of word of mouth publicity, and pushing books others don’t know about can be very exciting. So the main lesson from this part was to make friends with local booksellers and librarians, because they could be a big help and support. There was general chatter about that fact that both being a fan and engaging with fans can be exciting. According to Sophie even an imprint like Gollancz has its fans. They’re often loyal to the authors and will buy both print and hardcopy versions of books. And apparently genre fans are more likely than most to visit author websites and engage on social media. You have to show respect to fans and readers – don’t ever be dismissive or rude (Graeme). It’s important to cultivate your own distinct voice (Sophie). Pick a platform you’re comfortable with to focus on (Sophie). Promoting fellow authors, making friends with authors and bloggers, and talking with excitement about your own work can all help (Sophie). Be subtle in promoting your work – everyone rebels against being told what to do (Nazia). All of which reinforced the good practice that’s cited elsewhere, providing useful focus. There was talk of other subjects, including book launches, promotions and the value of building relationships with reviewers. But what a lot of it boiled down to was that if you work well with others, if you’re positive and supportive and take the time to interact in a meaningful way, then that good stuff will come back to help you. Persist, be positive and help one another – that’s right, good author marketing is about good old-fashioned hippy values, and that makes me a happy guy. So there you go – another interesting panel and hopefully useful for some of you. As we’re talking marketing I should point out that you can find links to buy my books here, and you can find me on Twitter as @gibbondemon . Now go forth, have conversations, be positive and persistent and all that good stuff. As Bill and Ted said, be excellent to one another.